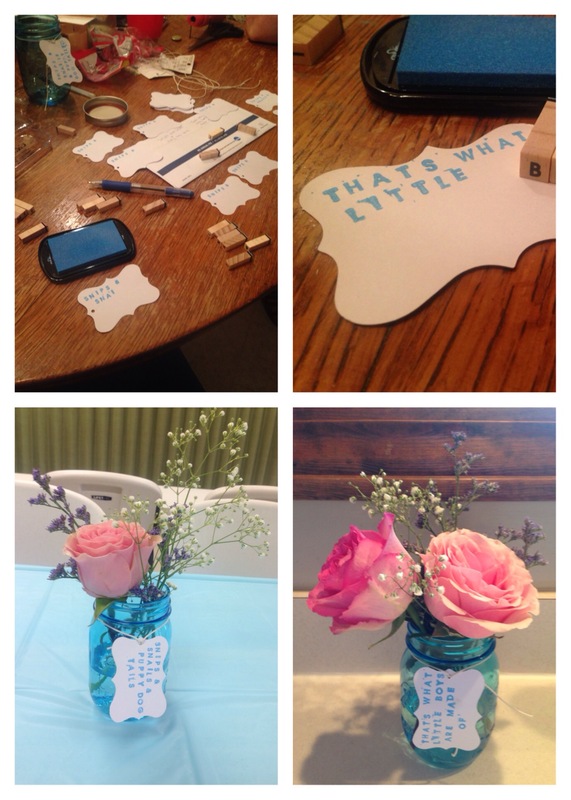 Last weekend we made center pieces and gifts for a baby shower. Using Mason jars and stamps, we hand stamped tags to say “snips and snails, and puppy dog tails” and another tag to say “that’s what little boys are made of”. Using rustic looking string we tied them to blue Mason jars. The day of the shower we bought roses, lavender, and baby’s breath to arrange in each jar. You can see below the end result! We put two on each table so each had a complete saying on it! We loved the end result, what about you? These are easy to make and are perfect for any shower. Rather than having the mommy-to-be wear fresh flowers, we wanted to give her something she can keep forever. We decided to make her a mommy-to-be badge. We went to our local craft store and purchased a flower, various ribbon, and a few baby themed stickers. Once we got home, we cut the ribbon to a length we thought would look good (it ended up being about 6 or so inches). Once all of our ribbons were cut, we sewed them in the layers of the flower so it wouldn’t show when you flip it over. After all the ribbons were sewed on, we put the mommy-to-be sticker on and sewed it in as well to make sure it didn’t fall off! We loved the end result, and so did all of the showers attendees! The first picture is a picture of our supplies, the second is of the finished product! The third picture is a picture of one of the game gifts. While at our local craft store we came across these adorable and vintage looking jars. Using our embosser and the stamp from the baby shower invitations, we embossed the tag to match the invitations. We filled the jar with cotton balls, a mini nail file, and a light pink Essie nail polish. They were a hit at the shower and simple to make! Finally, the gifts at every seat we had milk cartons (once again, purchased at our local craft store) filled with candy and embossed the tags to say “Thank You”. Using baby sized clothing pins, we clipped them to each box and were the perfect finishing touch to this shower. 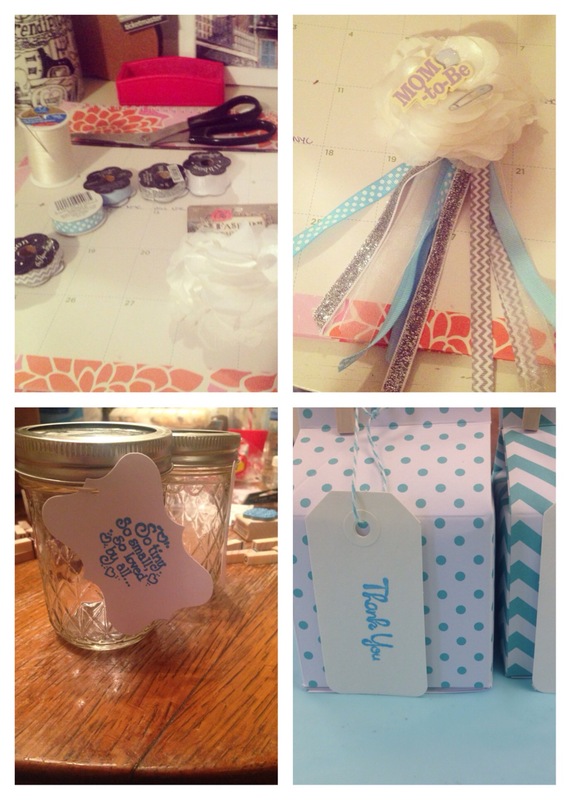 This entry was posted in Baby Showers, Pinterest Projects and tagged baby boy, baby shower, center pieces, essie, essie nail polish, event planning, mason jars, michigan, mom to be, mommy to be, nail polish, ohio, serendipity weddings and events. Bookmark the permalink.